This is probably the ultimate book for learning pen and ink drawings. It was published in 1976 and has been reprinted since. It's filled with easy-to-follow lessons that teaches how effects and textures can be created. There are lots of techniques to learn. The pen used back then and featured in this book is the quill pen. Ballpoint pen users might not be able to replicate the quill pen effects, specifically the drawing of thin and thick lines by applying different pressure. Other than that, the techniques can be used with other pens. There are lessons on tone building, working with light and shadow, sketching outdoors, drawing from photographs, composition and more. The examples included are mainly on still life, architecture and landscapes. They are beautiful and inspiring, from notable artists, and all come with commentary and analysis. Some of the work are really exquisite. This book is recommended to anyone who loves this medium. Good for all skill levels. We just used this book in our ink drawing class at university. Really nice as reference and learning material. Is this book pretty applicable to modern day ball-point pens as well? One of the Amazon reviews said that the material was geared too much towards Quill type pens. Will the techniques and everything still apply if we use ballpoint pens? Well you can use a lot of these techniques many different kind of pens. Of course you don't have the dynamic in your lines like you do with a quill. So some techniques won't have the same effect as you would with quill. This book is indeed geared towards pro-quill pens and markers, and not towards ball-point pens. This book teaches how to depict volume of form with lines and markmaking, rather than shading (such as with a pencil or ballpoint pen). 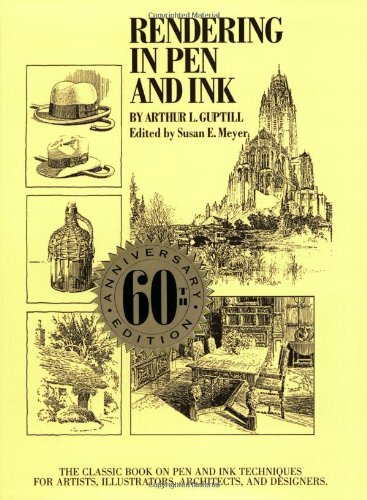 This is probably the definitive book on pen and ink. A must buy! The effects you produce with the ballpoint pen will look different, especially if you're using a roller ballpoint instead of an ink ballpoint (I use the Pilot v5 and v7). It's just like what Mo said earlier. My Grandfather gave me this book about 15 years ago, and I think he must have had it for about 15 years before that ! I am glad to see it is still going strong. It helped me in my earlier career, and I hope it continues to do the same for others. Good book. How does this book compare with The Technical Pen by Gary Simmons?